Digging is such a common turtle behavior that it’s easy to not notice your pregnant turtle is digging in preparation to lay her eggs. For a turtle breeder, it’s important to recognize nest-digging and to take steps to ensure the survival of the eggs. Box turtles are terrestrial turtles native to North America. The two major species are the common box turtle and the ornate box turtle. The first species includes subspecies the eastern box turtle, the three-toed box turtle, the Florida box turtle and the Gulf Coast box turtle. All of these turtles share traits and habits, including the ability to shut themselves completely inside their shells when threatened. 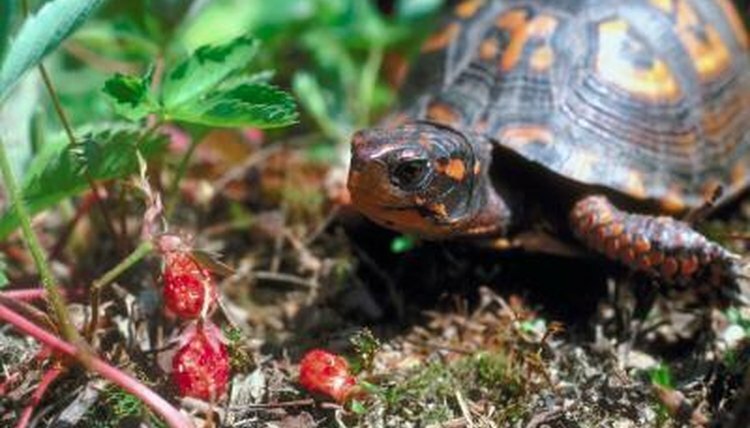 Box turtles love to dig and burrow, and they do so for many reasons. In the winter, they dig down and stay buried all season long while they hibernate. Similarly, during the hottest summer months, they will bury themselves and go into a state of semi-hibernation known as brumation. But even nonhibernating turtles like to hide; they will often bury themselves to sleep, whether in the wild or in outdoor or indoor habitats. With so much digging, you'll have to be discerning to determine whether a digging turtle is a pregnant turtle who is digging her nest. One sign to that she's pregnant is digging with her back feet and backing into the hole, as opposed to digging with her forelegs and going in head-first. Meanwhile, unlike a turtle who is simply burrowing, a nesting turtle will spend time on the nest, packing the soil to create walls and smoothing out a chamber in which to lay her eggs. Once the eggs are laid, she will fill in the nest and tamp down the soil until signs of her digging are virtually undetectable. If you keep your turtle in an outdoor enclosure, you’ll need to take measures to protect the nest from predators and keep the babies from escaping once they hatch. A simple way to do this is to cover the nest with wire mesh. If you have an indoor turtle who lays eggs in her terrarium, you will need to remove the eggs and incubate them to prevent the mother from accidentally crushing the nest. A good method is to place them in a small plastic tub filled with vermiculite or potting soil and place the tub under a heat lamp. Be sure to mist the eggs regularly with distilled water to keep them moist. Turtle eggs generally take between 75 and 90 days to hatch, and baby turtles spring from the egg fully equipped to feed and care for themselves. Their shells are soft, and they are easy meals for predators such as raccoons and skunks. They will need continual protection.